Have you ever come home, opened the refrigerator and stared into it like something would miraculously jump out at you that didn’t before? That’s the same thing that often happens when I troll the aisles of chain drug stores looking for deodorant. Don’t get me wrong, they aren’t all bad but sometimes I look hard for something else; anything other than what’s already there but somehow I leave without buying anything. As a result, I didn’t wear any deodorant for a long time. I don’t perspire a lot but the last time I left my pits bare, it was in the fall/winter so I could get away with it. With spring and summer on the horizon and perspiration due to increase, something had to change – enter Baxter of California’s Deodorant. The first time I smelled Deodorant, I thought I forgot to take a protective layer or something off the roll on. The scent isn’t as loud as most men’s deodorants can be. It’s Citrus & Herbal-Musk scent is subtly present and it won’t compete with your fragrance choice of the day. The citrus notes are in the background giving the scent a slight fresh lift but its earthiness is what will rope you in. It’s all man without the usual “guy” scent. For those with sensitive noses, I think you’ll find this wearable. For those with sensitive pits, this is formulated with you in mind. And it’s aluminum and alcohol free to boot. This entry was posted in Product review and tagged Baxter of California, details, grooming essentials, Men's Fragrances, Men's grooming, Mens Deodorant. Bookmark the permalink. Thanks. It’s a great product so it’s apropos. Love the metaphor of looking in the fridge and trolling the aisles…so true. Something that protects but doesn’t smell like everything else sounds like I need this NOW! 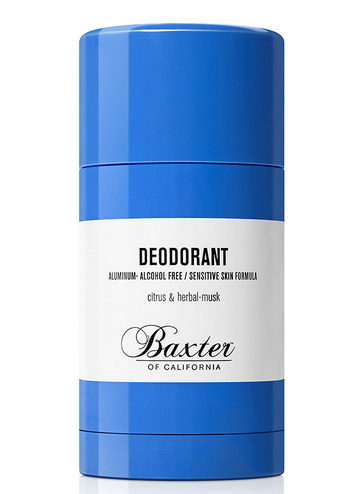 Baxter od California aluminum free & alcohol free deodorant for sensitive skin has been a longtime favorite product on the shelves of Thompson Chemists.